Here is my second post for Mother’s Day 2016 cards. 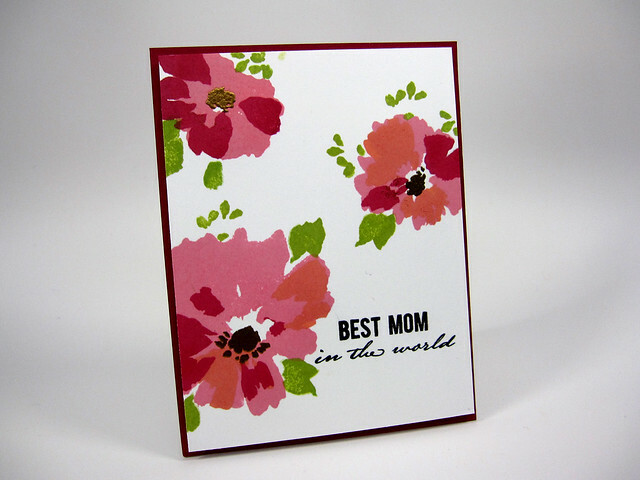 The card front is a single-layer, stamped onto a 4.00” x 5.25” piece of white cardstock which was later glued to an A2-sized colored mat that coordinated with the colors in the flowers and the entire front of the card was mounted onto a top-folding A2 card base. I used an Altenew layered stamp set (Watercolor Wonders). This is such a beautiful stamp set. The sentiment is from another stamp set by Altenew as well (Wild Hibiscus). After stamping the flowers, I used Versamark ink to stamp the flower centers and then heat embossed them in gold. I don’t know about everyone else, but I have trouble with the watercolor and layered stamp sets that are so popular now. I don’t seem to be able to get the layered stamping the way I want it or the colors the way I want. I’ve practiced many times, and I think I finally understand how to use the technique and line up the stamps (or at least the Stamping Gods were with me when I made this card). This is wishing you a happy, belated Mother’s Day! Supplies used in making this project. Inks: WPlus9 dye inks: Little Piggy, Sweet Nectar, and Sweet Gelato (flowers); WPlus9 dye ink: Last Leaf (leaves); WPlus9 dye ink: Black (sentiment); Versamark ink for flower centers (later heat embossed in gold). Cardstock: Neenah Solar White 80# for the card front, Stampin’ Up: Pomegranate (obsolete) for card front mat; Neenah Solar White 110# for card base. Other Supplies: WOW embossing powder in Gold Rich Pale. This entry was posted in Mother's Day, Occasions, Uncategorized and tagged Altenew. Bookmark the permalink.